Last Thursday, I graced Leo Burnett Philippines' invitation for the local unpacking event of 3 new devices (Galaxy Note 3, Galaxy Gear and Galaxy Note 10.1 Tablet) by Samsung Mobile Philippines at the Dusit Thani Hotel in Makati City. I went to the event as a digital influencer, representing the Android users community (specifically the Samsung Galaxy Groups from Facebook) and as a Recognized Contributor for XDA-Developers.com (on threads of Android devices which I personally own and official country groups on the forum – the Philippines, of course, in my case). Last week, Mark of TP invited me to give my initial impressions of the new flagship phablet by the Korean company and to share in the flesh photos of the device. I've always seen TechPinas as an important local hub for relevant tech information in the Philippines and as one of the most trusted and influential gadget blogs in the country so I immediately said yes. TP Friends, I hope you appreciate my thoughts and my photos. The Note 3 has a completely rehashed design identity - at least, when compared to its predecessors in this category - from the nature inspired curved design to the premium looking cornered look, taking cues from consumers who did not like the “plasticky” build of the first two Note releases. The bezel’s size was made slimmer and the whole shell simply looks more 'squared off' or less round (even when placed beside Samsung Galaxy S4) with a more 'flat' feel in the hand. The elegant metallic lining that wraps the unit is largely similar to what you can find on SGS4 but has subtle grooves for easier grip. The most noticeable change can be seen on the back cover, which aesthetically looks and feels like leather (even having faux leather stitching marks and design) but is, in fact, still plastic. 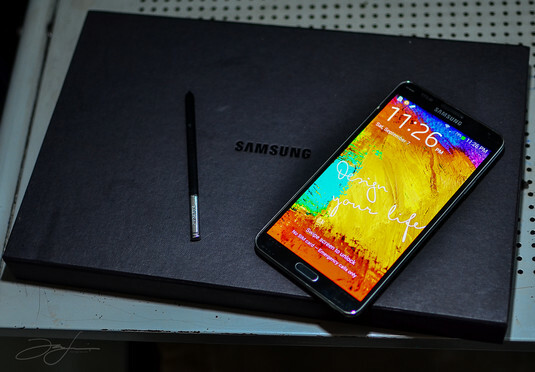 The weight is significantly lighter compared to Samsung Galaxy Note2, with almost the same dimensions (the Note 3 is slightly bigger but just minutely). The biggest difference is in the screen size, with the Note 3 sporting a 5.7 Super AMOLED vs. the 5.5 from the second Note. 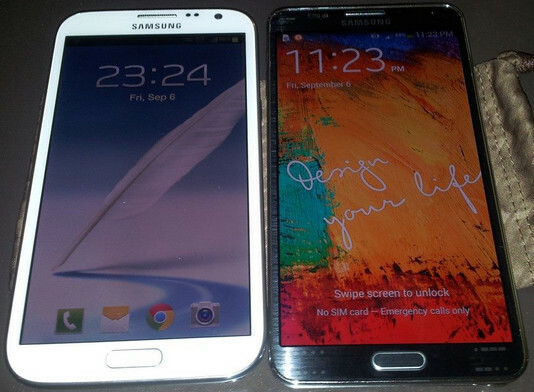 It may not sound like a big difference on paper but comparing both on hand, the Note 3’s screen seems to dwarf the Note 2’s. The power button still sits on the right side of the device with the volume rocker at the left, pushing these buttons is a breeze and is much easier than on previous Note devices and even compared to Galaxy S line phones. The speakers are found at the bottom of the device beside the MicroUSB port (and rumored USB 3.0 connector) and has one of the best sounding outputs for a mobile device so far (I think even better that those from the HTC lines). On top is the 3.5mm jack, microphone slot and the IR blaster, which I guess are staples for all mobile devices today sans the IR blaster. The body is slim, as the NFC has been moved to the battery itself. I am still disappointed that the microSD slot still is inside and not hot-swappable. I’ve never been a big fan of TouchWiz ever since I’ve owned my Galaxy devices as it has always been bloated and laggy and - worse - at times it hangs when the phone runs multiple opened tasks. My opinion on the UI of the Note 3 is more subjective, and generally I am impressed at how TW has evolved over the last Galaxy devices. With the Jellybean version at 4.3, Project Butter now seems to integrate well with the TW programs and apps. I was surprised with the superb multitasking capability of the phone, running 3-4 applications with the music on. With the variety of features offered on the Note line, operation now is a breeze and can be done with much ease, thanks to the improved innards. To be frank, almost the same unique features from the first Note lines were just carried over with the exception of the new gesture controls which they call the DOT, the CIRCLE and the SQUARE. Being a custom user, though, I was not surprised when these features shown during the unpacking -- but for first time users and avid stock TW fans it appeared new and innovative. The DOT gesture on the S-Pen, which you can do by pressing the button on the pen while hovering over the screen, shows a pie-like application tab where one can see options (In our custom users community, we call this the Pie Control and it has been around for about 8-10 months now). The CIRCLE (allowing you to create a circle on any page and grab it for later viewing, similar to Screenshot TX on the Chrome browser) is a little promising but is limited by what you can grab using it. The SQUARE, which lets users create a box on the screen using the pen, is promising and useful as you can doing it even while you're working on another application. So far, the number of apps that support these gestures are limited but I'm sure their number will grow in the future. The MultiView option has also been improved, now two identical applications can be opened top-bottom or side by side but the integration of data for both running applications is still the limiting factor (for instance, you can’t drag anything from one window to another and make it work. If you have two open Youtube apps, dragging the video on top to the bottom and make it play is not yet possible). 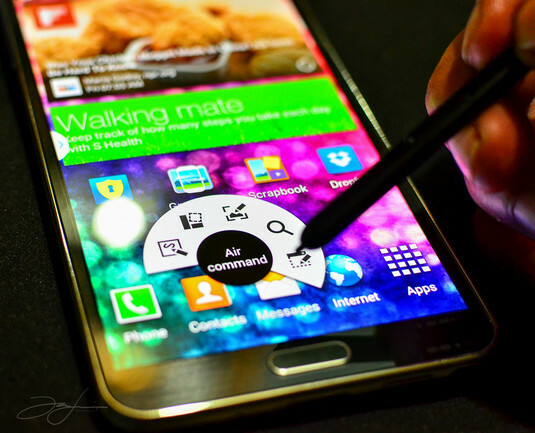 Hopefully, Samsung improves on these features and more. The camera sports a 13 MegaPixel sensor and has now integrated a lot of features found on other current Galaxy releases and on the Android Vanilla Stock cam as well. Shooting is much easier and almost has the same style for all Galaxy lines; You can focus on a subject simply by touching the screen. Image quality is excellent and the new low light capability of the camera takes mobile photography much further, although it takes a little on the quality of the shot but by just a little. I was very impressed by the surround 360 option and the panorama shot, almost seamless and the quality is superb even almost comparable to a compact camera. 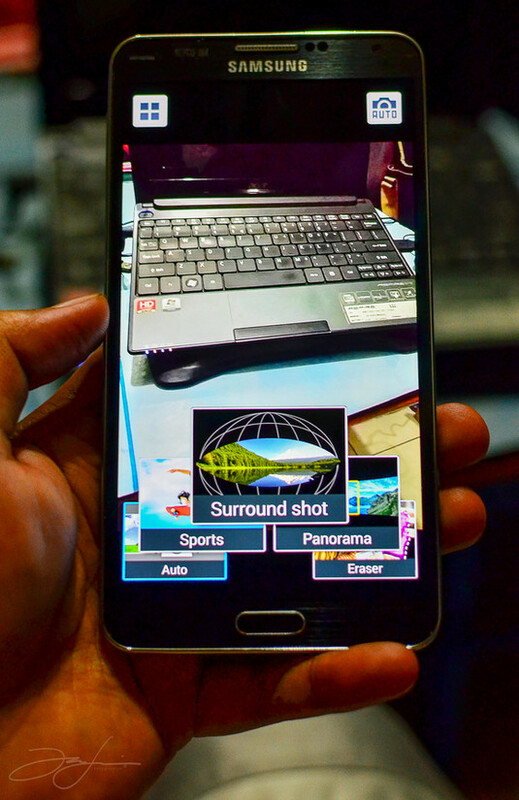 Integration between Note's native apps and the camera still is present and is now much faster thanks to the Snapdragon processor and the Adreno GPU. Obviously, apart from the S-Pen features and gestures, stellar imaging capabilities are what makes Note3 a stand-out phablet; I'm sure Mark of TP will publish more posts about it as soon as he gets his unit. Since my unit is a pre-production model *slash* final prototype, I cannot make a very conclusive review of the device yet (as changes could still be implemented on the final production units to be launched later this month). For the first 3 days of usage, though, I was surprised with the power management of the phone, I can almost make it last a whole day without charging (all radios and energy gulping back applications running plus the familiar bloats from TW since it is a stock device). It was both easy on the eyes and hands, easy to handle and pleasant to look at and read with (be it by browser, by watching videos and especially viewing hi-res photos and images). The smudgy Gorilla glass screen is still a bane to touch because of fingerprints but it can be easily removed by any cloth. I've dropped the device twice on a wooden floor and there was no sign of cracking or denting. And best of all, and hopefully not just by my imagination, running it on an intense benchmark for almost an hour, I just felt a slight heat on the unit. TP Friends, if I would rate it from 1-10, I'd give it an 8.5 as there's still a lot room for improvement. 1. According to Jay, Samsung Galaxy Note3 N9005 LTE with Quad-core 2.3 GHz Krait 400 CPU is the variant that will be officially released in the Philippines as it is the one that's compatible with the LTE bands of Smart Communications and Globe Telecom. 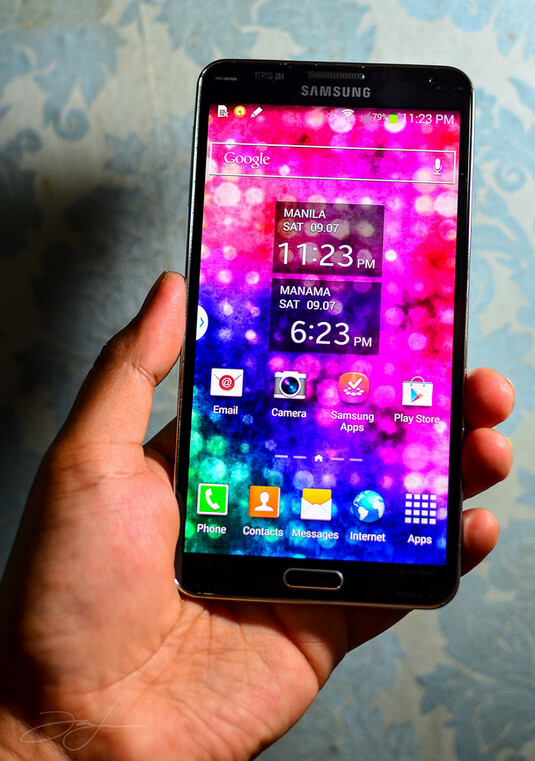 He also said that Samsung Philippines has yet to disclose the official SRP and release date of the phablet. 2. 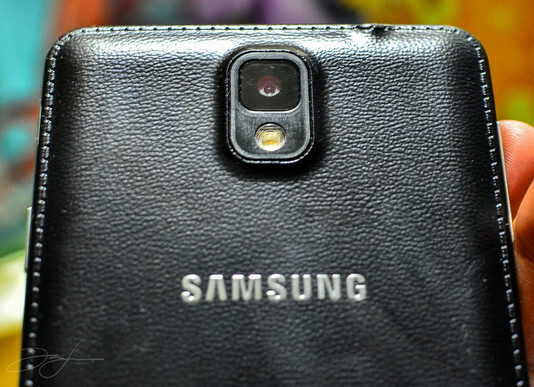 During his testing of the device, Jay's SGNote3 got an Antutu Benchmark Test Score of 27,337, which is more or less similar to the score of Samsung Galaxy S4 Quad Core version. Interestingtly, this is slightly lower than the regular scores of Sony Xperia Z Ultra and even Sony Xperia Z1. 3. I'm expecting Kimstore, my trusted online store, to make both the Non-LTE Octa-Core variant and the Dual SIM version of Samsung Galaxy Note3 available to all Pinoy consumers within this month or very early in October. TP Friends, if you have questions about this upcoming flagship device, kindly leave them in this post's comments section. I'm sure our community - including me and Jay, of course - will do its best to answer them.